There is no mistaking that the Pennsylvanian city of Pittsburgh exudes a rich history, with many grand landmarks, cultural treasures and impressive monuments. 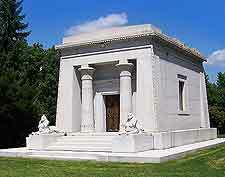 The city is home to a number of important colleges and universities, such as the Carnegie Mellon University (CMU) on Forbes Avenue, and the University of Pittsburgh on Riverview Avenue, the latter of which is home to the very famous landmarks of both the Allegheny Observatory and the towering Cathedral of Learning. The city's historical landmarks are in plentiful supply and include structures like the Colonial Trust Building on Smithfield Street, and also the Allegheny County, the City County Building and the Frick Building, all of which reside along Grant Street, in downtown Pittsburgh. Particularly noteworthy is the Trinity Cathedral, which completely dominates the 6th Avenue and was built over a three-year period, being finally completed in 1872 and today well known for its traditional Victorian appearance. 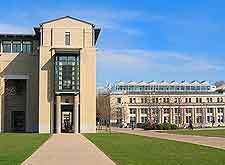 Operated as a private research facility and features almost 10,000 students and a faculty approaching 1,500 people, the Carnegie Mellon University was founded as long ago as 1900. Close to the Oakland neighborhood and Schenley Park, the campus of the Carnegie Mellon University is huge and spreads for roughly 150 acres / 61 hectares, with landmarks and attractions including seven different colleges and schools, football field, fitness complex and landscaped gardens. 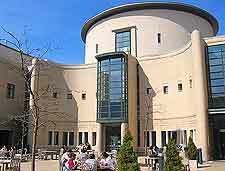 Of interest, both Toby Maguire and Michael Douglas filmed on location at the Carnegie Mellon University campus for scenes within the Wonder Boys movie, in the late 1990s. The Allegheny County Courthouse is a striking government building which was built in 1884, being designed by leading American architect Henry Hobson Richardson. This landmark features a stylish Romanesque facade with arched windows, an interior courtyard, a historic prison and a tall stone tower. 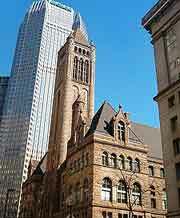 The Allegheny County Courthouse is still functioning today as a working courthouse and welcomes visitors. The City County Building is an important historical landmark and first opened in doors just under 100 years ago, in 1917. Housing both the offices for the city of Pittsburgh and Allegheny County, the City County Building features a main hall, with a painted vaulted ceiling and a series of golden columns. 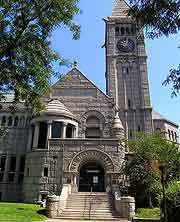 The Colonial Trust Building was historically home to a series of different businesses and today serves as the home of the downtown Carnegie Library of Pittsburgh, whilst also operates as the Point Park College's Library Center. Inside you will discover equally impressive architecture, with marble staircases, stained-glass windows, landscape paintings and antique furnishings. 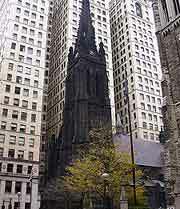 The Frick Building is one easily distinguishable landmark on the Pittsburgh skyline and sands near to the Allegheny County Courthouse. Commissioned by local industrialist Henry Clay Frick and the structure's namesake, the Frick Building remains an integral part of the business district. The lobby is particularly elaborate, being decorated with gold planting and ornate marble features. Hartwood Acres Park covers more than 600 acres / 243 hectares is located within Allegheny County and is roughly 10 miles / 16 km to the northeast of central Pittsburgh. The main landmark of interest within the park itself is the Hartwood mansion, an imposing Tudor-style building dating back to 1929 and surrounding by public gardens. Hartwood mansion is home to many priceless antiques and each winter plays host to the annual Festival of Lights. Part of Pittsburgh's famous Trinity Cathedral was rebuilt during the late sixties following fire damage, although the landmark still features an unmistakable historical, Victorian character, particularly when you step inside an explore the interior and courtyard area. Look out for the seasonal choir concerts, which take full advantage of the excellent acoustics. Union Station also goes by the name of the Pennsylvania Station and is often shortened to simply 'Penn Station'. Located on the corner of Liberty Avenue and Grant Street, Union Station was designed at built at the very end of the 19th century and is an instantly recognizable landmark, boasting an unusual rotunda structure and corner pavilions. Completely restored in the 1980s, the elegant Union Station continues to serve as a working railway station and is part of Amtrak's busy Pennsylvanian route. The University of Pittsburgh has long been one of the city's most important landmarks and was established as far back as 1787. Today, the university is called home by almost 30,000 students and a staff of around 6,500. Attractions of note include the Allegheny Observatory, which features guided tours each Thursday and Friday between April and October. Marking the very heart of the campus, the university's Cathedral of Learning is nothing short of a national landmark and towers over 160 meters / 525 feet in height, resembling a stylish skyscraper in its appearance. 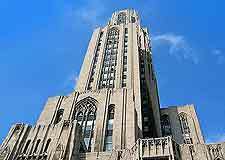 The Cathedral of Learning is open to members of the public and comprises a total of 42 different floors and boasts late-Gothic style architecture.